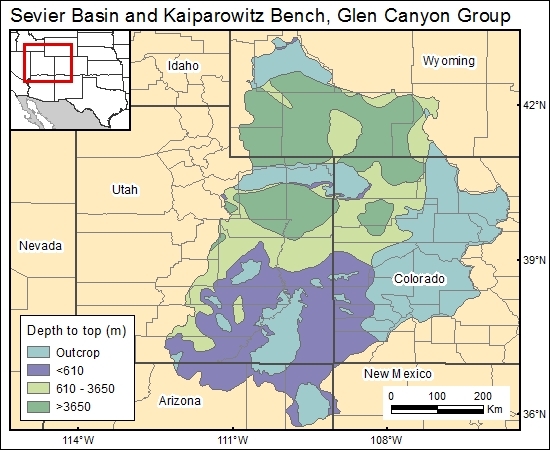 The principal sources for inference of formation depth of the Glen Canyon Group are Freethey and Cordy (1991) and Freethey and others (1988). A generalized map of formation-depth ranges in polygon format was provided by the U.S. Geological Survey (1996). Freethey, G. W., and Cordy, G. E., 1991, Geohydrology of Mesozoic rocks in the Upper Colorado River Basin—excluding the San Juan Basin - in Arizona, Colorado, New Mexico, Utah, and Wyoming: U.S. Geological Survey, Professional Paper 1411-C, 118 p.
Freethey, G. W., Kimball, B. A., Wilberg, D. E., and Hood, J. W., 1988, General hydrogeology of the aquifers of Mesozoic age, upper Colorado River basin - excluding the San Juan Basin—Colorado, Utah, Wyoming, and Arizona: U.S. Geological Survey, Hydrologic Investigations Atlas HA-698, scale 1:2,500,000, 2 sheets. U.S. Geological Survey, 1996, Ground water atlas of the United States: Segment 2: Arizona, Colorado, New Mexico, and Utah.